Select Rocky's stores now offer Primo-brand bottled water. In thousands of blind taste tests conducted nationwide by an independent agency, 3 out of 4 consumers preferred the taste of Primo over the nation's top-selling spring waters and 4 out of 5 preferred Primo over tap water. Primo WaterPrimo Water is purified to the highest industry standards using a 9-step process that includes sand filtering, carbon filters to remove chlorine disinfection, reverse osmosis or distillation, micro-filtration to remove very small particles and microbiological constituents and then ozonation to ensure the water is completely disinfected. Primo Water's "Zero Waste" Exchange Process Purchase a bottle of Primo Water at select Rocky's Ace Hardware locations in Florida and Massachusetts. Return your empty bottle to the participating Rocky's for recycling and get a ticket for a discount on your next purchase. 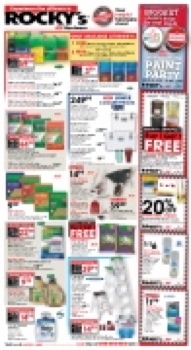 Buy your next bottle of Primo Water and save! 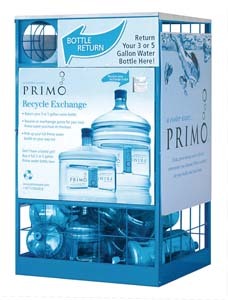 Primo Water sterilizes and reuses each bottle up to 40 times. Once they are no longer able to use the bottles, the plastic is recycled to become other products, such as carpet fibers and other packaging materials. By keeping 370,000,000+ single-use bottles out of our landfills, Primo Water has saved over 44,000+ barrels of oil (or more than 1.8 million gallons)!